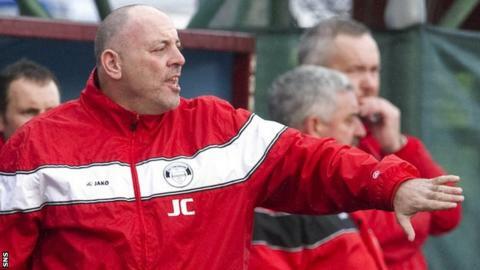 East Stirlingshire are seeking applications for the post of head coach after John Coughlin rejected the offer of a new contract. Shire sit sixth in League Two, retain an outside chance of reaching the promotion play-offs and Coughlin will remain until the end of the season. "It would have been the club's wish for John to stay and continue that job," the Falkirk club said in a statement. "However, he has decided it is time for a parting." Coughlin, who was born in New York, was previously manager of St Mirren, Berwick Rangers and Stenhousemuir and has been in charge of Shire since May 2011. They finished bottom of the table in his first two seasons but now lie seven points behind fourth-placed Clyde and third-top Stirling Albion with three games remaining. The club have been impressed with this season's improvement under the head coach and his backroom team of Matt Kerr, Arthur Bell and Alex Connon. "They arrived with the club at a low ebb and, even with limited resources available, remained committed to what was a very difficult task," said the website statement. "That perseverance has delivered considerable reward this season with the team maintaining a credible challenge for a place in the promotion play-offs. "He has left the club in a far stronger position than when he arrived and, for that, everyone with The Shire at heart owes John their sincere thanks." Coughlin, whose side defeated second-placed Annan Athletic on Saturday, will remain in charge while the club, who have been sharing Ochilview Park with local rivals Stenhousemuir after selling Firs Park in 2008, seek a replacement. Shire say they are seeking applicants, no later than 24 April, with "at least a Uefa B Licence coaching qualification" , while "experience of working within senior football, either in a playing or coaching capacity, is desirable for this part-time position".